Many products have certain “product use” requirements and constraints such as use in outside environments under unusually hot and cold temperatures. While not in use, the product’s storage may be as important. Heavy vibration, force from wind and moisture also may need to be addressed. Our product Analysis has several purposes and is done specifically in the Solid Works program. 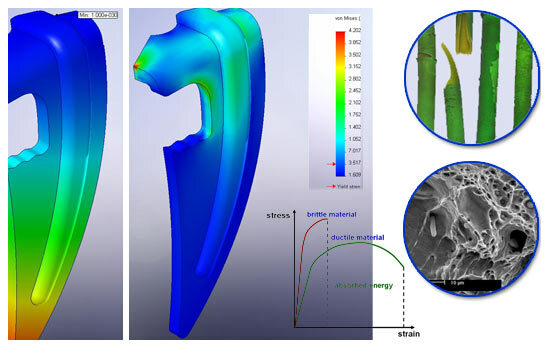 Structural integrity of the parts can be determined through FEA: Finite Element Analysis. While part assembly fit can be determined though an interference fit calculation, Motion Studies may also be done in SolidWorks to confirm form and function of moving parts. Other analysis such as thermal stresses, fluid sealing, air pressure and air flow measurements, as well as microscopic materials analysis, may also play a part in our product development process. All this effort occurs prior to the Prototyping stage.